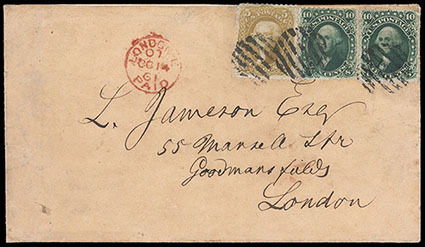 1861, 10¢ dark green, First Design, two singles, in combination with 1861, 5¢ buff on cover to London, England, all tied by grid handstamps with red "London, Oc 14, 61" entry cds, unusual use without origin cds; small stamp flaws and backflap skillfully repaired, Very Fine appearance, a very rare combination of both the scarce 1861 10¢ First Design and 5¢ Buff issues. Scott No. 62B+67 Estimate $1,000 - 1,500. 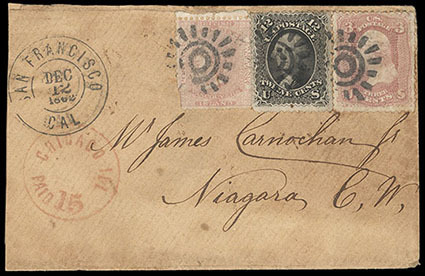 1861, 12¢ black, used with 3¢ rose (65) and British Columbia & Vancouver Island, 2½d dull rose (2), piece out prior to use at bottom left, tied by cogwheels, matching "San Francisco Cal. Dec 12, 1862" double-circle datestamp on buff cover to Niagara, Canada West, red "Chicago Ill., Paid 15" transit, "G.w.R., East, JA 2" arrival backstamp; slightly reduced, few faults, Fine and scarce use, There is no indication of where this originated as the British Columbia stamp was cancelled on arrival in San Francisco. Scott No. 69 Estimate $500 - 750. 1861, 30¢ orange, radiant color, used with two 2¢ black (73) singles, tied by segmented cork cancels, matching "New London Con. 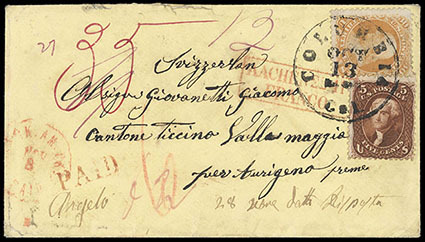 Feb 19" double-circle datestamp on 1867 buff cover to Valparaiso, Chile, New York red "12" credit handstamp crossed out in blue crayon and update to "24" cents, "A, Panama MR 2 '67" transit cds, Chilean red "25" centavos inland postage due handstamp, sender's note on back reads "Mrs. Alsop & Co, Please deliver to Capt. Hinckley immediately if in port and if left forward to his port of destination and oblige, Respectfully A.F. Prentis", 30¢ small tear at lower left, a Very Fine use at the 34¢ rate to South America, ex-Friedman, DuPuy; with 2014 P.F. certificate. Scott No. 71 Estimate $500 - 750. 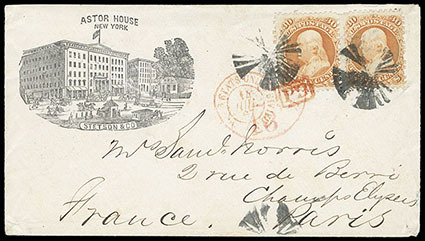 1861, 30¢ orange, horizontal pair, rich color, tied by fancy segmented circle of wedges foreign mail cancels on illustrated "Astor House, New York" corner card cover to Paris, France, additionally tied by red "New York, 48, Jun 2" exchange cds and boxed "PD" handstamp; right stamp with pulled perf at top left and cover missing backflap, otherwise Very Fine. 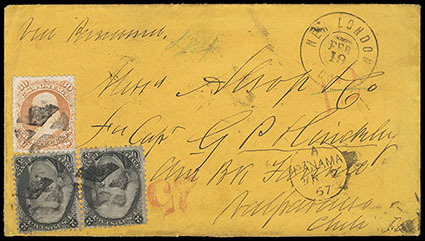 1863, 2¢ black, left gutter margin single showing portion of adjacent stamp, tiny corner crease, canceled by quartered cork handstamp on fresh 1867 printed circular from New Orleans La. to Bremen, Germany, tied by New York large red "1" credit rating handstamp, Very Fine prepaid printed matter use to Germany. Scott No. 73 Estimate $500 - 750. 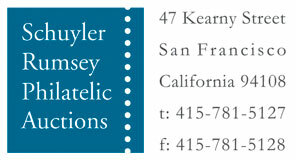 In 1867 printed matter could be prepaid to the destination. Circulars were rated as printed matter (rather than newspapers, as before). The printed matter rates were 1¢ to Hamburg and 1½¢ to other parts of the G.A.P.U., both up to 1 ounce. 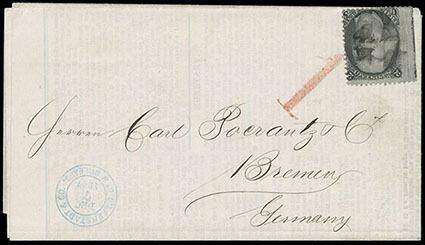 The U.S. credited to Hamburg ½¢ if addressed to Hamburg and 1 ¢ if addressed to other parts of the G.A.P.U. Whether the circular was sent by Hamburg or U.S. packet was irrelevant. New York began using credit stamps ½ and 1 on circulars, indicating they were being treated as printed matter. The red and black colors of the handstamps were irrelevant. 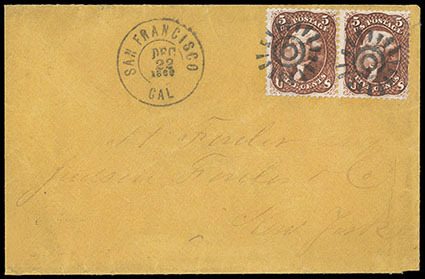 1862, 5¢ red brown, horizontal pair, rich vibrant color, tied by cogwheel cancels (type II), matching "San Francisco, Cal., Dec 22, 1862" cds on orange buff cover to New York N.Y.; cover reduced and sideflap missing at left, otherwise Very Fine, a very scarce usage of the 1862 5¢ red brown paying the 10¢ west to east coast rate, ex-Gibson. Scott No. 75 Estimate $400 - 600. 1862, 5¢ red brown, used with 30¢ orange (71), tied by "Columbia, Cal. Oct 13" cds on yellow cover to Switzerland, red "PAID" handstamp magenta "35" prepaid restatement, red "N.York Am. Pkt., Paid, Nov 8" exchange cds and magenta "12" cent credit rating, red "Aachen, Franco 22/11" framed transit, magenta "f 2" rating, red crayon "6", Locarno (11.25) arrival backstamp; some edge wear and each stamp with small fault, Very Fine and attractive use. Scott No. 75 Estimate $300 - 400. 1863, 24¢ grayish lilac, tied by New York foreign mail grid cancel, red "N.York Br. 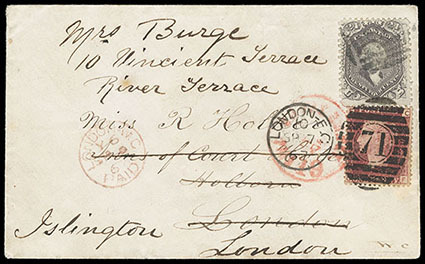 Packet 'Paid 19' Aug" exchange office credit cds on 1867 cover to London, redirected to Islington on arrival with Great Britain 1858 1 d red (SG 43) tied by bold "London SP 7 '67" duplex, Very Fine and most attractive forwarded use; with 1993 Rendon certificate. Scott No. 78a Estimate $400 - 600.